“If I have a gift for anything, it’s that I love to find obscure and wonderful things,” says Michael Sappol, PhD, a curator-historian at the National Library of Medicine (NLM). He proves that talent as editor of the new book, Hidden Treasure: The National Library of Medicine, which showcases the world’s largest medical library and its remarkable collection. Sappol calls the book a “wonderful collaborative project” that involved the energy and expertise of more than 100 people inside and outside NLM. Two years in the making, Hidden Treasure was created to celebrate the Library’s 175th anniversary (1836-2011). Sappol was determined to produce a volume that would show off the richness of the collection, and the curiosities it contains, to distinguish NLM from other libraries. While NLM is a medical collection, Sappol notes it is a historical collection that can be used by scholars studying not just the history of medicine, but also art, anatomy, culture, women’s studies, African American studies, and the military for example. “In showing off these many different kinds of objects, we are reaching out to people who might use our historical collections and saying, ‘Here’s stuff you might not know about. '” It’s also an invitation to the general public to peruse the collection. 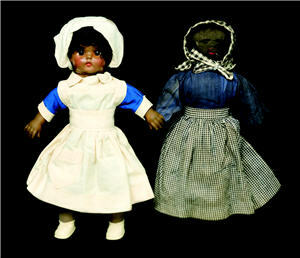 Dolls that help tell the story of nurse-midwives, a volume on the art of palm reading and Adolph Hitler’s medical records are among the 83 items featured in the book. Each object is artfully photographed and accompanied by a brief essay from a contributing scholar explaining the significance of the item. “Through this book, readers will learn about the remarkable depth and breadth of NLM’s historical collections, as well as the rich history of the Library itself,” says Jeffrey S. Reznick, PhD, head of the NLM History of Medicine Division where Sappol works. Reznick, a social and cultural historian of medicine and war, contributed an essay on the in-house magazines produced by US military hospitals in World War I to distract soldiers from their war wounds. Sappol, who is a historian of medical illustration and anatomy, contributed three mini-essays. One describes White’s Physiological Manikin (1886), which is one of three life-size manikins in the Library’s collection. Selling for $35 back in the day, the cardboard manikin, filled with folds and flaps, was used for classroom instruction. Photographing the manikin was a special, yet fun, challenge for NLM conservator Holly Herro. She and colleague Kristi Wright-Davenport assisted photographer Arne Svenson on the photo shoots. Their job was to help Svenson execute his vision for the photograph by setting up the objects without damaging them. “We were crawling all over the floor on hands and knees, up and down on ladders, all over the Library looking for places to shoot,” says Herro. 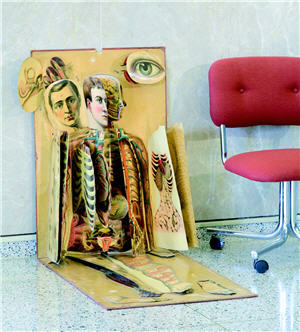 Svenson photographed the 19th century manikin sitting on the floor of the Library lobby, next to a modern chair. Herro says in order to keep the manikin’s flaps open for the photograph, she and Wright-Davenport used polyester film to devise support structures to stuff inside the flaps to keep them in place. The 83 items in the book were winnowed from an original list of more than 400 possibilities. A deciding factor was that the item had to be visually interesting. “The project became an opportunity for me to poke around in odd corners of the Library and say ‘what’s that?’ and ‘what’s that? '” says Sappol. In doing so, he uncovered “a great find,” the St. Elizabeths Magic Lantern Slide Collection (1855-1890s), un-cataloged because of a backlog. The slide projections were used in the 19th century to help treat patients at St. Elizabeths Hospital for the Insane in Washington, DC. Hidden Treasure is a large, hardback book of nearly 240 pages. It’s filled with 450 full-color illustrations and something else. “It represents my love for the Library,” Sappol says. 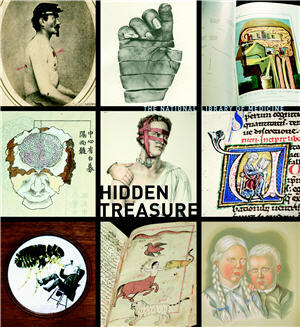 Hidden Treasure is available as a free download from NLM’s Digital Collections. The book also is available from its publisher, Blast Books, and major online booksellers.